When I first started teaching, I knew I wanted my kiddos to engage with text in a meaningful and purposeful way. 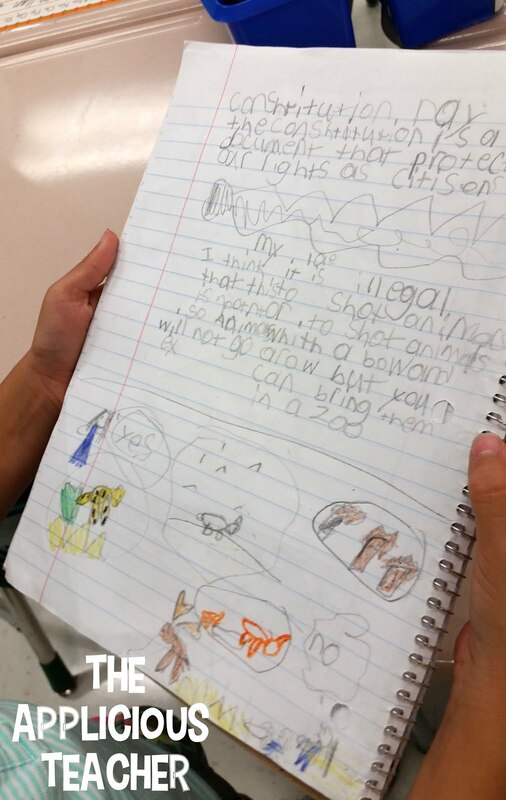 Not just a worksheet that went with what we were reading… But a real way for my students to share their thoughts, ideas, and opinions as it related to what we were reading. My solution? Reading Response Journals or RRJ as I like to call them. So many of you have asked about this simple journal! I thought it’s about time I share the ins and outs with you on why, year-after-year, I still have my students work in their Reading Response Journals or RRJ’s. What are Reading Response Journals? 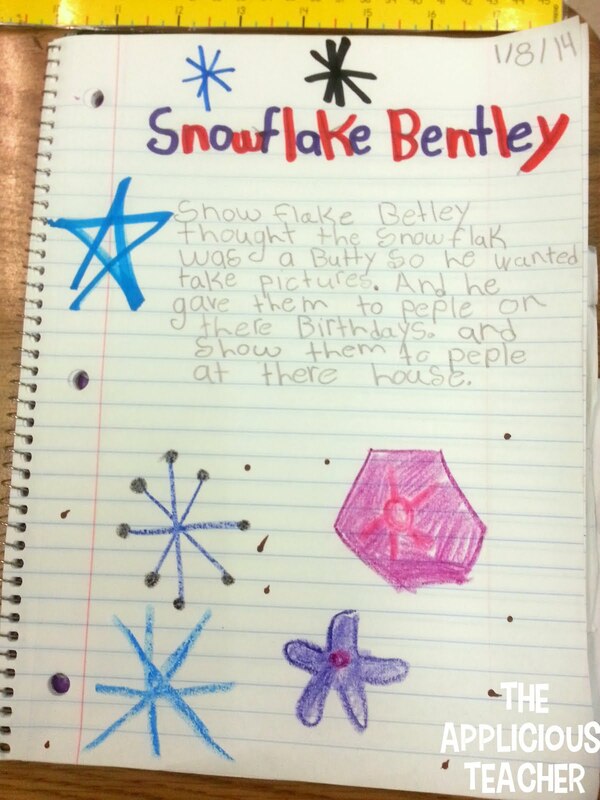 Simply put, a Reading Response Journal is a place for students to write, draw, and share their opinions, ideas, or respond to text we have read in class. There’s nothing fancy about these. They are just cheapy spiral notebooks I buy at BTS time for like 15 cents each. Then, we make a cover and keep them in our desks. You can grab the cover I use for FREE right here. Don’t get me wrong, I “sorta” like using ISNs in math and science. (And by sorta I mean if there wasn’t so much cutting and pasting with trash all over the floor…) But this notebook is much more casual then that. Rarely are we cutting and pasting into it. It is used as a grab and go, a quick write, share my opinion, write a sentence or paragraph, notebook. How Does it Fit into my Routine? Well that is the best part of a Reading Response Journal… it’s a chameleon of journals. We use it for quick writes on a specific topic, or as a place to share our learning from particular unit. But most importantly it is the place where we WRITE ABOUT TEXT.We use them before reading, during reading, and after reading. We also use them during center time, and sometimes we even use them during Science and Social Studies! Reading and writing go hand in hand. We expect our students to absorb so much from the text that they are exposed to yet, we rarely give them time to process, sort, or “think through” what they’ve read in a non threatening way. 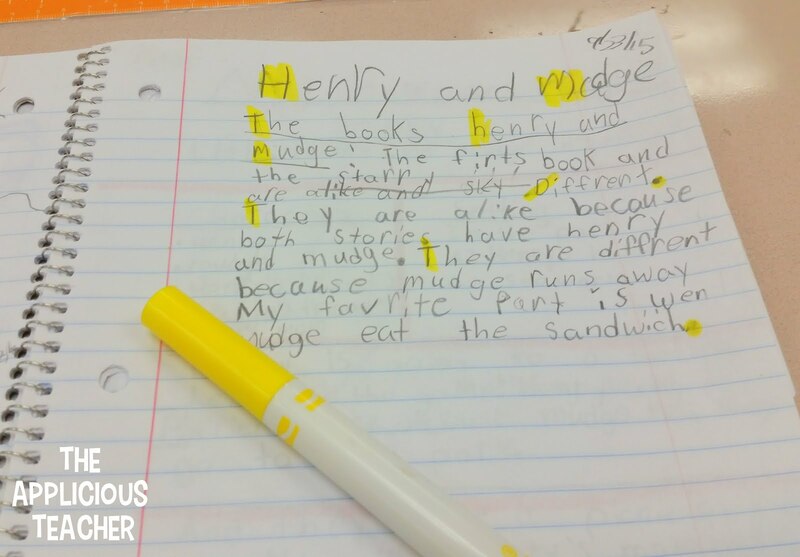 Reading Response Journals bridge the gap between reading a text and writing to the text in a logical and easy way. This is the main reason I started using Reading Response Journals. I wanted a place for students to write down their thoughts quickly… No passing out papers, no big long drawn out process… just a quick and dirty write up. Here, we had just read the story, “Animals Should Definitely NOT Wear Clothing”. This book is perfect for making an inference, but I wanted to engaged my kids before we started reading, so I had them tell me why they thought animals shouldn’t wear clothing. This was a simple way to get them thinking without all the hoopla! For Responding to Text… This is by far how we use our notebooks the most. After reading a text (and possibly SNOTS-ing it up!) We’ll use what we’ve read for writing about it. You can read more about this activity here! 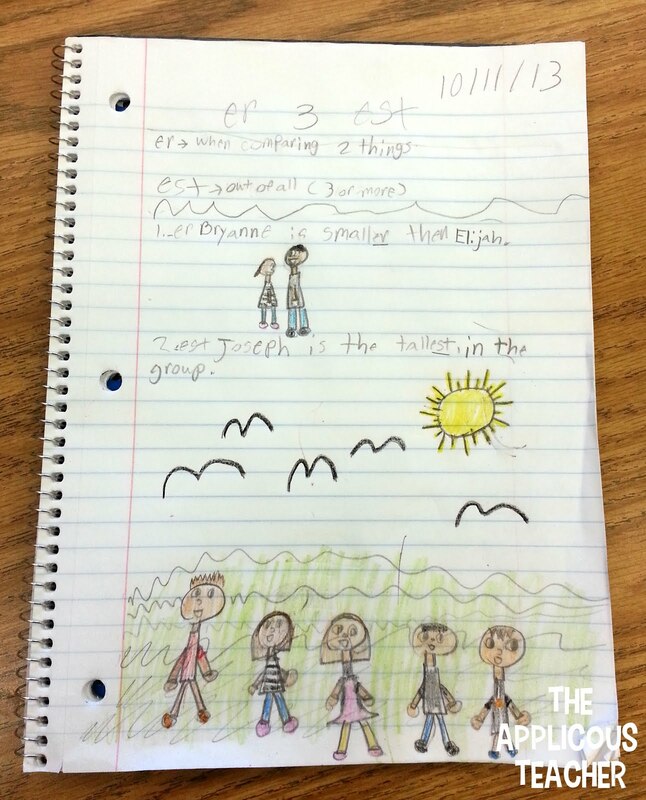 Our Reading Response Journals are the perfect place for students to retell a story in their own words. Since our RRJ are always in our desks, they are the ideal spot for us to take notes that can be used later. 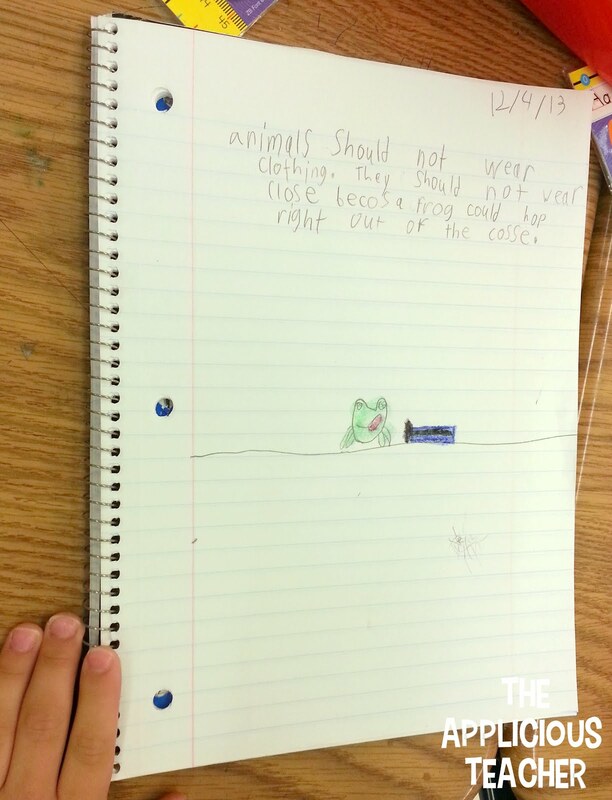 Here, we took notes on how animals clean themselves based on a book we had read. 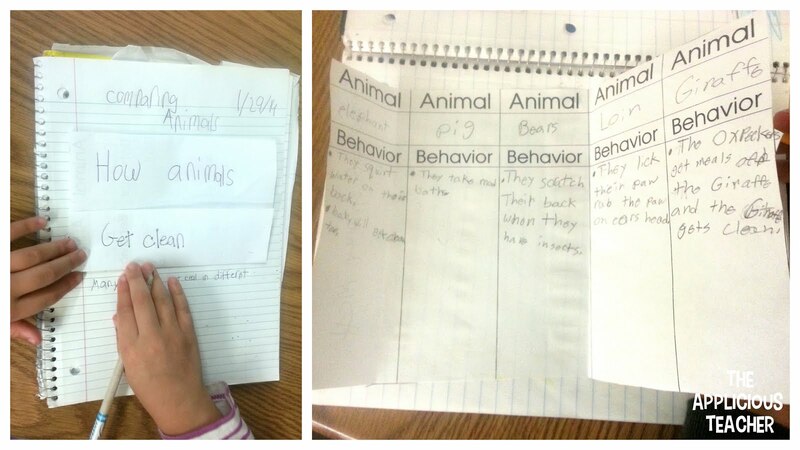 Later, we used the chart to compare two of the animals. I love using our Reading Response Journals as an easy place to make reference sheet for new skills we’re learning! 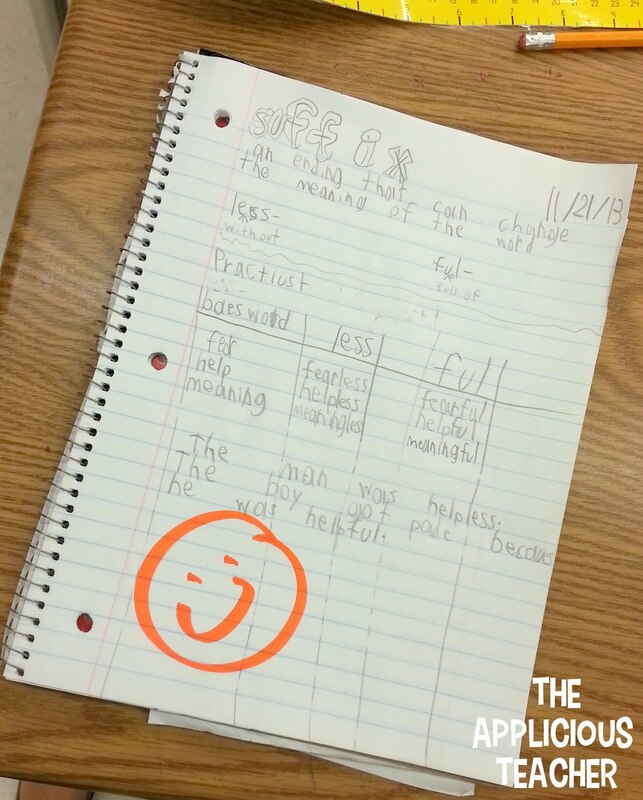 Here, we were learning about the suffixes -less and -ful. After discussing these two common word parts, we made a quick reference page for when/how to use them and even did some practice! Here’s another reference sheet we had made for adding -er and -est to words. I LOVE integrating Science and Social Studies into our literature block. It just brings the learning alive! So sometimes our RRJ are used to write about different processes we’ve learned about. 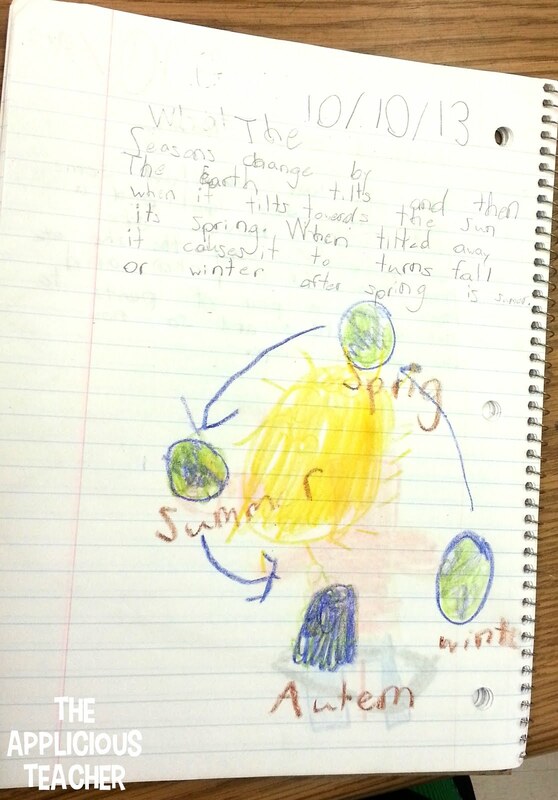 We wrote about why the season change during our study of Fall. 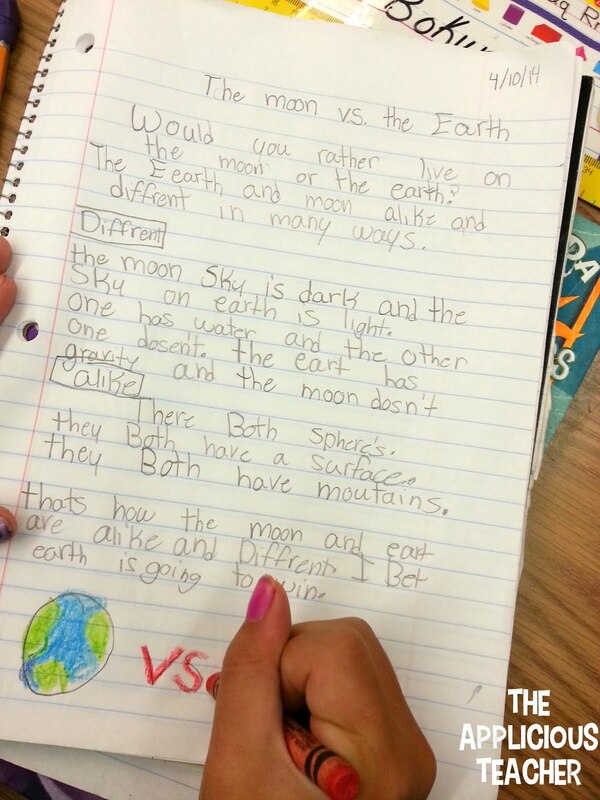 Here, during our Moon and Space study, we used our new found understanding of the moon to write about how the Moon and Earth are different. We even took some notes on the Constitution after learning more about it on Constitution Day. I’m sure most teachers would say, “Oh I collect their notebooks every week to check and correct every single page we’ve done..” and you know what? 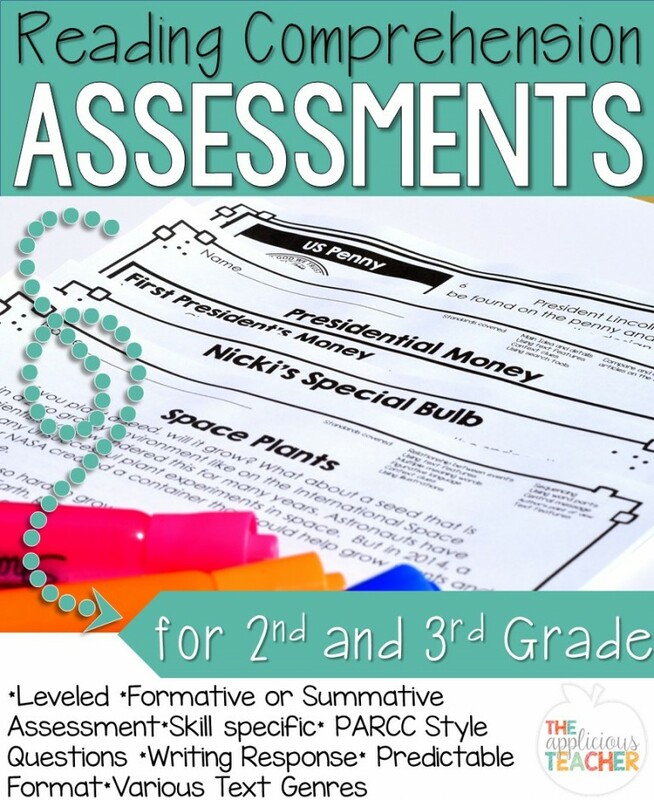 Maybe you are that teacher and all I have to say is good for you… But for me, the LAST thing I need is another thing to grade or collect! That’s why checking my student’s Reading Response Journals is always done on the fly. If I am spot checking their work, I’ll usually just put a star on the page that says, “hey- I saw this”. If I’m looking for something in particular, as students finish their writings, I’ll go around and check what they’ve written. 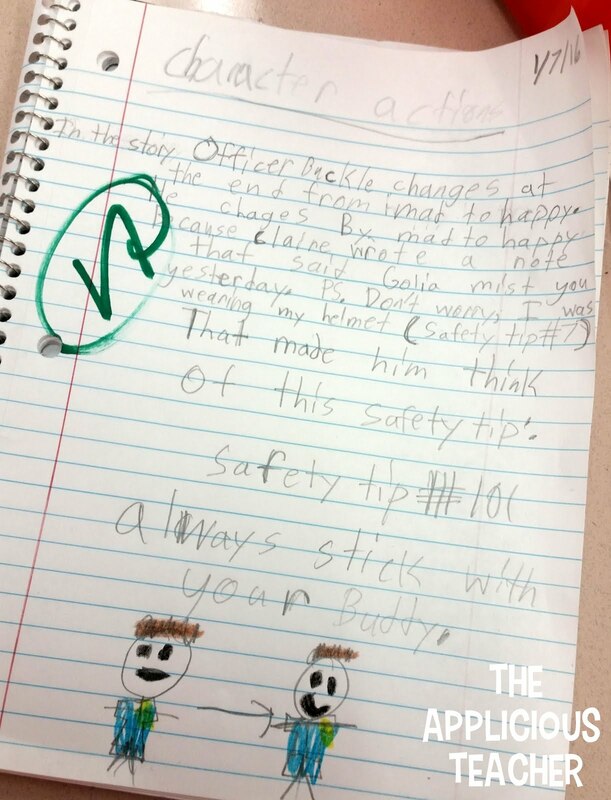 Here we had documented how Officer Buckle reacts to different events in the story, “Officer Buckle and Gloria”. A check plus means they’ve got it! As I check over student’s work, I can easily see who’s met the objective and who still needs coaching. This allows me to reteach and provide immediate feedback as needed. No need to lug home tons of notebooks for review. Ain’t nobody got time for dat! I also use the information that I can gather from their responses for forming my small group lessons later in the week. 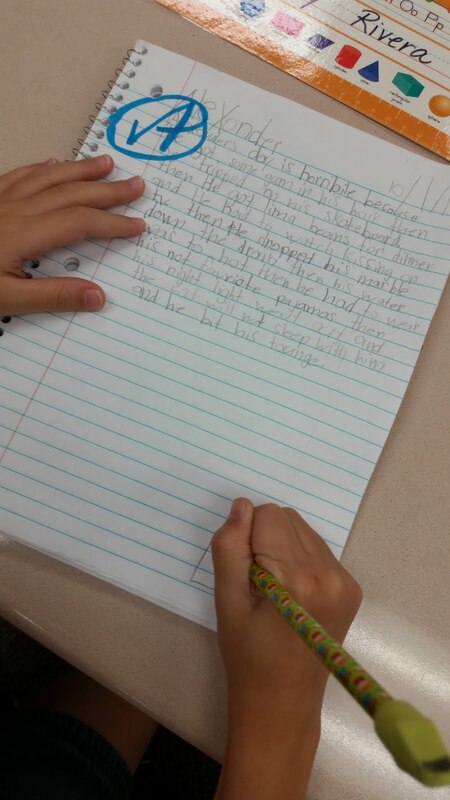 Class struggled with finding the main idea of a paragraph? Looks like I can cover that in my small group. So, those are the ins and outs of my FAVORITE routine. 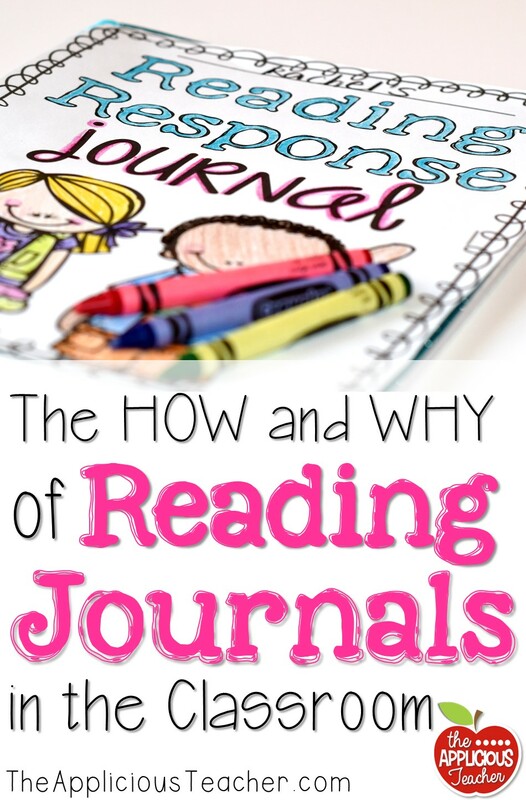 Do you have your students keep a Reading Response Journal? If so, tell me what you have them write! Oh my gosh! You was just made my day! I was curious about RRJ and how to implement them. Thank you!!!!!! Interested to know if you tab the notebook for different subjects (Reading, word work, social studies, etc.) or if you just have kids write on the next page regardless of what they are writing about. I love this idea for my second graders and how quick and easy it is! These look amazing! This is an idea I may have to try with my class next year! I just found your blog and I love it! I just discovered your blog when I was searching for a few things on Pinterest. I love your Fix-it Up Cards. I am teaching fourth grade and wanted to know if there was a way that I could edit the sentences to make them a little more challenging for my older students. Not at this time, but I do suggest you grab my second set, Fix it Up II as those were designed for mid year with my third graders! I love the way you use your RRJs. This is more up my alley than most I have seen. I prefer the more casual approach as well. I just have never been able to keep up with the more uptight (specific rules) of other notebooks. Thank you. I was looking for a way to hold my students accountable during a silent reading center and this just sparked my interest on revamping my reading block.